If anything burned with the passion of a thousand suns, it was my hatred of New England Patriots Quarterback Tom Brady. As any University of Tennessee fan will tell you, that pretty much came with the territory in the days when Peyton Manning was shredding NFL defenses, setting record after record, and legitimately in the debate for GOAT (Greatest Of All Time). For years it was Brady and Manning, and while one could point to Brady’s Super Bowl wins, Manning’s godlike statistics and passing records at least put him in the discussion. But now, with Brady seemingly on track to play until he’s 50, win at least 10 Super Bowls and methodically destroy every single one of Manning’s records, even this die-hard Manning fan has been forced to admit the obvious - Tom Brady is the greatest NFL player of all time, and it’s not even close. Read the rest of the article and you’ll find out that’s mostly because of his perceived politics and, apparently, because Brady is white, or something. Imagine a column titled “[Black Person Name] and the culture of black crime,” but I digress. Bottom line: The only thing significant about Tom Brady being white is being able to laugh at liberals obsessing about it. From childhood, Brady has embodied this very concept of white privilege. His dad brought him to Niners games, where he was able to learn from the great white men, Joe Montana and Dwight Clark. His family grew up without financial pressures. He was never hassled by police or suspected of drug use. Despite a mediocre high school career, he was awarded a full athletic scholarship to Michigan, one of the best football programs in the country. There, Brady played only two seasons, neither of which warranted much attention. His combine performance was far below the acceptable benchmark for a professional athlete. First of all, are we truly to believe that only white people attend pro football games? 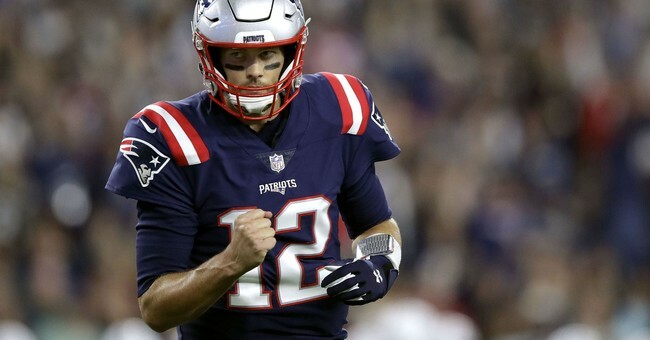 To this writer’s other points, Brady was an All-State high school player who became a pretty sought-after college prospect with offers at several Division I schools. He ultimately chose Michigan, where he entered college as seventh on the school’s depth chart and struggled mightily his first two years before eventually earning the starting spot. His last two years at Michigan, however, were marked by a 20-5 record and two major bowl wins. Something tells me, however, that this writer would have still complained had Brady won the National Championship both years. “How many black players would have been given so many chances despite a lack of production?” the writer asks later, as if no black players ever got second chances and, even more strikingly, as if the NFL were a mostly-white league. Let’s face it, liberals hate winners. And from high school to college to the pros, Tom Brady has epitomized winning in its purest form. If you took everything else away, simply displaying excellence, dominating opponents, and winning consistently week in and week out is enough to earn the ire of any dyed-in-the-wool beta lib. Brady’s been pretty coy about his politics, which is only understandable if he leans right-of-center, especially considering that, were he a leftie, he would have shouted his “virtue” from the rooftops long ago. Even before his friendship with Trump became a headline, Brady attended George W. Bush’s State of the Union address the same year that Massachusetts Democrat John Kerry was running against him for president. These days, any star NFL player is required to at least give a nod to the ‘take-a-knee’ nonsense, and Brady has, but were he forced to choose, I’m betting the guy would be a conservative rather than a liberal. Finally, there’s this hilarious gem from HuffPo, claiming that Brady’s “Politics Are More Un-American Than Colin Kaepernick’s Have Ever Been.” So, there’s that. Sure, the MAGA hat incident was 2015 and only because he was “friends” with then-celebrity billionaire Donald Trump, but still, the thought of Tom Brady wearing a MAGA hat is pretty freaking awesome. Look, it doesn’t matter if the Patriots like it or not, they are the official team of American White Nationalism, the MAGA Boys On the Field. You can’t implicitly or explicitly support Trump, who reads speeches written by Stephen Miller as a matter of course, play in a market whose sporting culture is renowned for its racism, have a decade-plus organizational obsession with undersized white receivers, and be called, no sh*t, the Patriots, without getting the vile Fox News Soup that poisoned half the country on your shirt. Try to put on a bib of distancing yourself, deflecting questions, telling everyone your wife told you to stop talking about it, that sh*t isn’t gonna work. You’re the MAGA Kid. It’s on you forever. It stalks and haunts you. It’s obvious that these people think supporting Trump is essentially the same as “white nationalism,” which if you ask me waters down the term “white nationalist” just a tad. But when have liberals ever let reality get in the way of rhetoric? At any rate, the libs’ disdain for Tom Brady and the Patriots has almost turned this former Brady-hater into a die-hard Brady, and Patriots fan. I’ve got to turn this column in before knowing for sure if the New England QB will have won a 6th Super Bowl Sunday night, but I’m betting he will, and I’m betting the libs will hate him even more for it.